Gone are the days when grandparents use to teach their grandchildren how to walk holding their little fingers. It’s a high tech age and every small gesture that was practiced in old days has been upgraded by the technology. 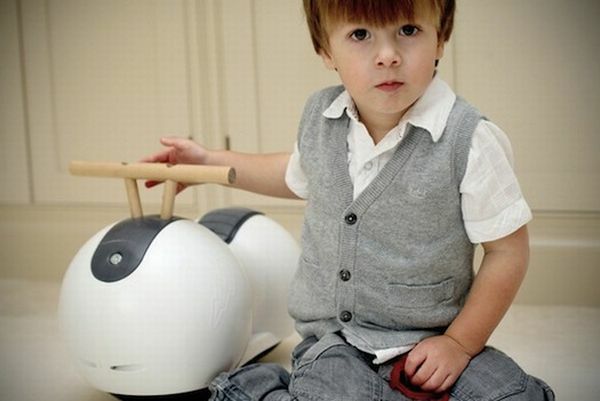 Early rider, a British company has come up with a revolutionary ride-on bike for children ranging between one and two years of age. Christened as Spherovelo Juno, this unique ride-on toy has been created using two spherical balls wrapped with a hard nylon shell. The main aim was to give hours and hours of riding pleasure to toddlers and to develop their balancing skills that would prepare them for a life on two wheels. the bike comes with two riding modes: stable and unstable. Stable for the beginners and unstable for the experienced ones, where you remove the stabilizing balls and the toy becomes tippy. This helps a lot in developing the child’s sense of balance and equilibrium to keep them moving on the little bike. It might seem unsafe but it isn’t because the bike has spheres instead of wheels therefore, even if the kid slants the spheres quickly relocate to maintain the equilibrium and don’t let the child trip over. The design is simple and minimalistic. The company is planning to produce extraordinary preschool and first bikes for kids keeping in mind fun as well as safety. These bikes, also known with the name “safely unstable,” will be available in the market in various attractive colors from the mid of May.